SKU: 4012927644928 Categories: Trading Card Games, Yu-Gi-Oh! Sacred Phoenix of Nephthys rises from the ashes and is reborn as a Ritual Monster! Both the Phoenix and its attendant, Hand of Nephthys, are making the jump to the modern era. Each has a Ritual Monster based on the original card, and they also get their own cadre of Level 2 attendants that let you destroy your own cards to use their effects. Destroy another card in this theme, and its own secondary ability will activate in your next Standby Phase, giving you two great effects for the price of one! The Link Monsters in this theme are based around Ritual Summoning multiple Ritual Monsters. One gathers the pieces you need to Ritual Summon or revives fallen monsters, while the other powers up based on how many Ritual Monsters you use to Link Summon it. Pint-sized pranksters that are up to no good! They may look sweet and innocent, but the 3 main effect monsters in this strategy can combine in 6 different ways to cause chaos! This theme makes use of Fusion Monsters alongside Link Monsters, and its Main Deck monsters give you more materials to work with when you use them to Fusion or Link Summon. Each of the Fusion and Link Monsters can be Tributed for a special effect. Most of them simply split back up into the monsters you used to make them so you can switch your strategy on the fly, but the strongest among the monsters can be Tributed to replicate the effects of Raigeki or Harpie’s Feather Duster! Lastly, Zombie-Type monsters inspired by Japanese legend manifest as a new Synchro Summoning strategy! This Deck employs the classic “Synchro Climb” strategy with a twist: once you’ve finished climbing to the highest Level Synchro Monster, you’re able to Summon the previous Synchro Monsters back each time your current Synchro is destroyed and activate their extra effects! This strategy can bring out each of its Synchro Monsters in a single turn thanks to its Tuners that keep Special Summoning themselves from the Graveyard. This theme’s Link Monster becomes intangible when it’s pointing to a monster, and chills an enemy monster to the bone, shrinking its ATK and DEF each time your opponent destroys a Synchro. 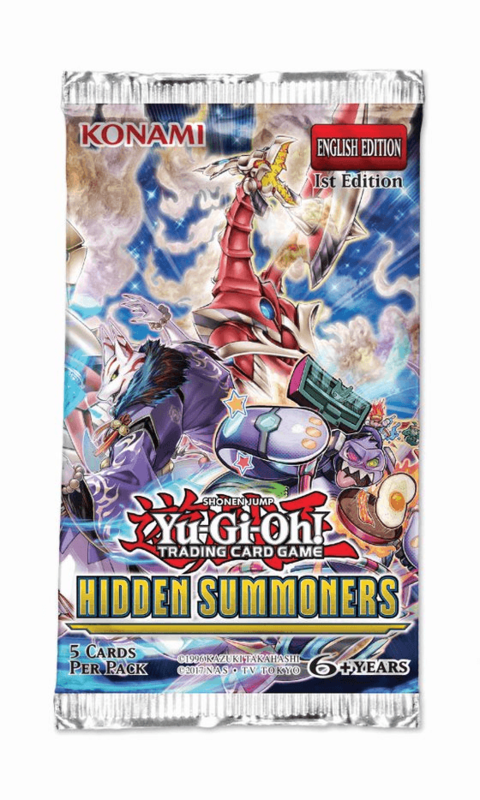 The Hidden Summoners booster set contains 60 cards: 40 Super Rares 20 Secret Rares.